In order to complete work on major projects, we have suspended full publication of Aristos until further notice. Meanwhile, we will be posting dated commentary and news items on this page each month. Since September, this page has carried the announcement you see above, explaining the absence of articles, reviews, and other features from Aristos. Each month since then, the left-hand contents column of our home page has been virtually empty. Until today, that is. What happened? Our plan was to write two "brief notes" (that's how we've always referred to our "Notes & Comments" in-house--and how we titled the similar feature in our print version). One was to be a very short review of the marvelous Renaissance Portraits exhibition now at the Metropolitan Museum of Art. The other was to be a brief comment on the work of Chuck Close--who will be featured at the 2012 National Art Education Association convention in March, and who has long been a star in the contemporary artworld for the humongous "portraits" he produces by transferring headshot photos to canvas. Both pieces, like Topsy, "just growed." We trust you'll find the results of interest. 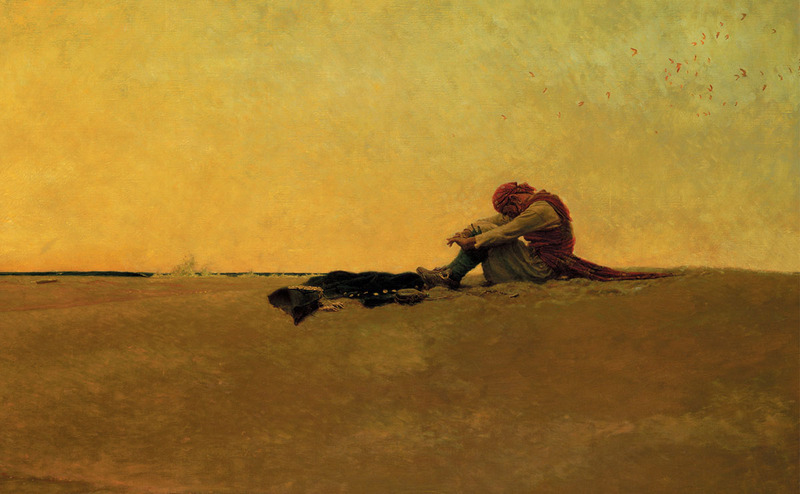 Howard Pyle: American Master Rediscovered, Delaware Art Museum, through March 4, 2012. Illustration does not, strictly speaking, qualify as "fine art." But in the case of Howard Pyle (1853-1911) [more] that hardly matters. Pyle is one of any number of illustrators from the "Golden Age of Illustration" [more] who also made independent paintings, and whose illustrations often transcended their primary function in books and magazines. In fact, only a fine definitional line separates the best paintings made for the purpose of illustration from comparable standalone paintings. A case in point is the Delaware Art Museum's Marooned [more] (1909), by Pyle, which seems not to have been intended to serve as the basis for an illustration. It was, in fact, based on an illustration [click on image to enlarge] he made in 1887 for Harper's Magazine. Such a work calls to mind the art of Winslow Homer (who, as it happens, began his career as an illustrator)--see, for example, The Lifeline [more] (1884). Both sides of Howard Pyle, an illustrator who also made art, are on view at his Delaware retrospective. --L.T.